Alkyl halides that can readily form carbocations will undergo elimination to form alkenes. Unimolecular eliminations reactions, abbreviated E1, are reactions where the rate is linearly dependent on the concentration of only one compound (the substrate). This is a stepwise mechanism in which the rate-determining step is the first step where carbocation is formed. The base does not participate in this step, and therefore, the concentration of the case does not affect the rate. In E1 reactions as well as in SN1, the reactivity of alkyl halides is the same: with tertiary halides reacting most readily. Thus, tertiary carbocations are more stable than secondary, and primary carbocations are too unstable to form. Usually, weak bases are used as nucleophiles. 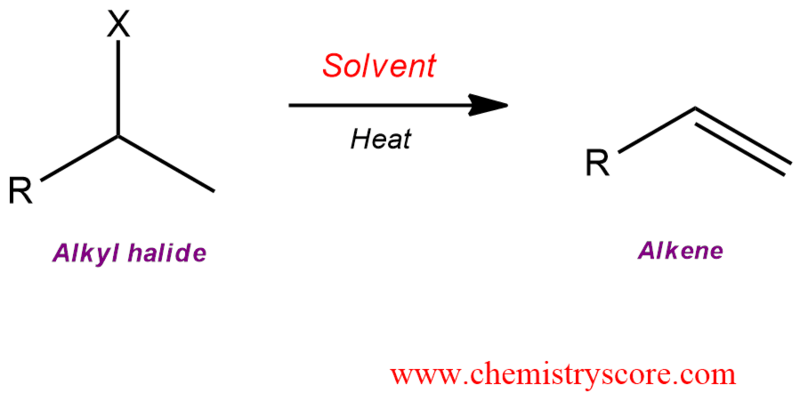 In solvolysis, this is a solvent (water, alcohol). As we know, if we have a bad leaving group, it must be first protonated to give a better leaving group. And this will be the first step before the loss of the leaving group. The second step includes deprotonation of the carbocation which is formed in the previous step. Any hydrogen positioned on any carbon next to the center bearing the leaving group can participate in this step. In this reaction, the proton is carried off by CH3OH as CH3OH2+, an alkyloxonium ion. The carbon left behind rehybridizes from sp³ to sp². The remaining electrons overlap with the empty p orbital at the neighboring cationic center and build a π bond. The result is a hydrocarbon containing a double bond so-called an alkene.